Pinnacle’s 2015 Annual Review Has Arrived! Our 2015 Annual Review represents our fourth year of sharing perspectives and stories with our entire network of valued relationships and connections. We appreciate the opportunity to revisit the challenges and achievements of the year behind us and focus strategically on achieving an even higher level of service and capabilities in the year ahead. 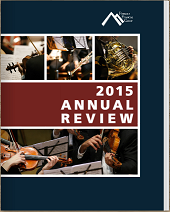 Click here or the image below to read our 2015 Annual Review.